Let’s face it. Mobile devices are pretty cool. They can be your personal trainer, your pocket jukebox, your navigator, your conversation partner, and your heart rate monitor. You can check and change your home thermostat remotely, video chat with someone across the globe, test your hearing, make a movie, mix an original song and, oh yeah, make phone calls. Why shouldn’t we be enamored by these amazing devices that have become so much a part of our everyday lives? It should be no surprise why they have achieved such universal acceptance in such a short time. They can solve many problems and meet many needs. But does all this technical wizardry skew our perception of mobile content delivery when it comes to mLearning? It can and it will if you are not careful. It’s very easy to let the technology and the form factors distract you from your actual goals. Here are some points to remember as you embark on your first or any mobile learning implementation. First of all, this point is made on the assumption that you have a business case. If you don’t, you are already walking down the wrong path. A sound strategy and a clearly defined business case are absolutely mandatory for your initiative. You should be able to articulate the reason you are creating your app in a simply stated story. If you begin to let the unmatched features of mobile technology capability divert your attention from your learning objectives, you can easily confuse your target audience, too. For instance, if you added audio to an application where it really wasn’t needed, you are losing the battle. Not only that, you are increasing the scope, schedule and budget for something that is not even needed. That would be frowned upon by executive management, purchasing, and by virtually anyone involved in the project. Build a good, strong business case and stick to it. Bringing in lots of different options and variables for the user can also cloud your thinking about what you are truly trying to achieve. If you try to put too much into a mobile app, it can become bloated and result in a bad user experience. This can happen not only with the technology but with the user interface design as well. If you have a confusing mishmash of navigational paths, your learner can get lost in the app. When designing a mobile application, a good rule of thumb is to think simply. Easy navigation. Quick paths to information that is needed for the specific context. This is learning on demand and you don’t want your audience to feel like they are opening up a Russian nesting doll just to get to the information they need at that moment. Don’t forget: there are interface guidelines for the major operating systems that have solved GUI issues for you. Take advantage of them. Yes, it’s good to be ambitious. Nobody’s arguing that the mobile learning application should be the best that it can be. But just because the magic exists doesn’t mean you have to use the magic. You have access to the accelerometer, but does it really meet the needs of this mobile learning? A camera is a powerful tool, but if photos have only a marginal benefit, don’t include it. It’s true that you want your audience to have an excited and positive response. It’s not often that a learning deliverable of any kind elicits a remark like, “This is so cool!” Your mobile app might do that, but if it’s just cool for cool’s sake, the luster will wear off and your audience will simply want the app to meet their needs. Do you go to a movie that had amazing special effects and a lousy script? Don’t let that be your app. 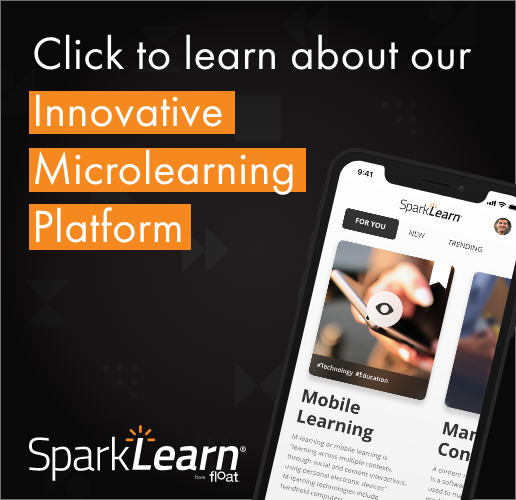 This is an exciting time for enterprise learning as companies and organizations figure out how to effectively use mobile learning. If you have ever spent some time with anyone from Float, you know we have bought into mLearning 100 percent. We can see the unlimited potential of the mobile platform and how it is changing the way that enterprise audiences are trained. At the same time, we work hard to keep our enthusiasm in check by always striving to create effective mobile learning. And to do that, it might mean saying no to the Big Shiny. It might mean sacrificing the Totally Awesome to develop the Totally Useful. That should not be a new goal for you, anyway. Isn’t that what we have been always trying to do, no matter if it is eLearning, ILT and now mobile learning? Learning deliverables should make the target audience better at what they do. Mobile learning is no different. The amazing capabilities of mobile can help us get there or it can sidetrack us from that goal. It’s important to know when the timing is right – if ever – to release the unicorns. » Mobile Strategy » Release the Unicorns! One Response to Release the Unicorns!